"The SHADOW and the Bloody Hand of Doom"
Here's my cover for THE SHADOW #7 due in stores in October. I wanted also to let everyone know I received my Artist Proofs (see above) for the CREATURE FROM THE BLACK LAGOON poster art I did for Mondo. The amount is very limited (about 20 copies) so I am trying to figure out how to put them on sale (and find out related shipping method/costs - never shipped something this big) and make it a very limited/special poster to hang on your wall. Tune in middle of the week for details. EISNERs, The Black Beetle, and Creature From The Black Lagoon! But the Eisner on Friday night was just the cherry on top of a great couple of days at SDCC. Yes, during the Dark Horse panel on Thursday, I announced the upcoming (and long awaited) NO WAY OUT, a new Black Beetle mini starting at the very beginning of 2013 and that will tell the story that some of you have started reading in the (now sold out) Black Beetle #0 ashcan. Last but not least, on Friday morning MONDO released my first poster I did with them: CREATURE FROM THE BLACK LAGOON, part of their Universal Monster line. The poster, limited and numbered to 325 copies, sold out within an hour. I am expecting a certain number of Artist Proofs so stay tuned on my blogs or on my twitter feed (@f_francavilla) for the chance to get a copy if you missed out in SD. Hope you all are as excited as I am for the Eisner, The Creature, and - most of all - for more Black Beetle! First: my most recent cover for THE SPIDER to celebrate this Pulp SUnday. SIGNING at DC Booth #1915 - bring your Black Mirror HCs or Swamp Thing #10 issues by to get them signed. An In-Depth Look at the Best in Creator-Owned Comics— Just over 25 years ago, Dark Horse arrived with a different agenda than any other publisher in comics. The young company was founded on the belief that comics creators should have the option to retain the rights to their own work, and today it continues to be a highly fertile breeding ground for new characters and concepts. Self-publishing sensation Sam Humphries introduces Dark Horse publisher Mike Richardson, along with a cast of top talent from around the industry. Expect exclusive announcements, and much, much more! FF: make sure to check my twitter feed (@f_francavilla) at 10am for details on the what and where! Afternoons at TR!CKSTER will feature THE ARTISTS’ WORKSHOPS, a series of informal demonstrations by a gathering of today’s top visual storytellers. Designed to allow for up-close-and-personal demonstrations of technique and method, these workshops will feature artists creating original works on-site and in the moment, from watercolor and acrylic to pencil and ink. Work might include actual comics pages being produced, thumbnails, or original paintings that might be used for production. Some work will be available for sale as its produced, some just for demonstration, but these workshops have been hailed as some of the more memorable experiences at TR!CKSTER. Make sure to include this experience in your schedule this year! Demonstrating artists will include JILL THOMPSON (Scary Godmother), JIM MAHFOOD (L.A. Inkstains), FRANCESCO FRANCAVILLA (Black Beetle, Sorrow, Garrison), FABIO MOON (BPRD, Casanova), SCOTT MORSE (Strange Science Fantasy, BRAVE), ARMAND BALTAZAR (The Collidescape Chronicles, Pixar designer), and an assortment of other top visual storytellers from comics, film, and illustration backgrounds. Artists will vary daily. CBLDF Art AuctionA first look of preview images is available at http://tinyurl.com/CBLDFauction or at the CBLDF’s booth, number 1920! This auction will take place at the Hilton Bayfront, in the Sapphire AB Room, at 7:30 pm. YOU DO NOT NEED A COMIC CON BADGE TO ATTEND. More art will be added up til the auction begins! FF: I have two pieces in this auction Captain America and Golden Age Sandman (see below). Pls bid generously for a great cause. above you can see the cover of LONE RANGER #7 which kicks off a new arc titled NATIVE GROUNDS, written and illustrated again by Ande Parks and Esteve Polls who are making this one of the most consistently good read on the shelves. I am up for the prestigious Harvey Award in the Best Colorist category for my work on BLACK PANTHER (see below) in 2011! "Final ballots are due to the Harvey Awards by Friday, August 17, 2012. Full details for submission of completed ballots can be found on the final ballot. Voting is open to anyone professionally involved in a creative capacity within the comics field. 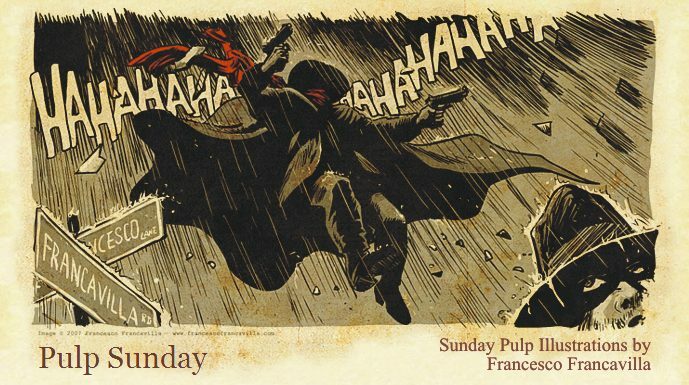 Final ballots are available for download at http://www.harveyawards.org/"
Time for another Double Feature here on Pulp Sunday. Here's my covers for DARK SHADOWS #11 an THE SPIDER #3.